JaDoX is a standalone digital document management system, which also serves as the digital library module of Qulto. 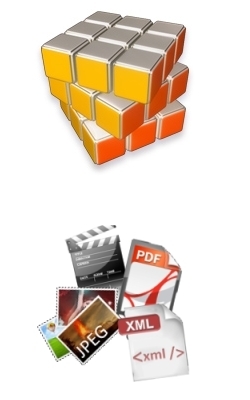 JaDoX is an efficient and comprehensive help for processing, storage, display and search of digitized documents. In functionality it fully complies with the requirements for a digital library. The software consists of az open source, independent and free database system (PostgreSQL, RDBMS) and platform-independent JAVA applications. These applications are the JaDoX server and the fully configurable web interface (JSP, Tomcat/Jetspeed portal framework). In the following list we marked the tasks the software can support with an ? Proofing can be done in any word processing program, or later in the JaDoX editor form. At „Docment upload” the digitized documents can be imported in two ways: one by one, or in ZIP archive (bulk import based on nomenclature). From the viewpoint of the other component the storage is the JaDoX server, which places the metadata in a relational database. For this purpose we use a DTD-independent relational data model. Moreover the XML is also stored (for application independent use and for better speed). The web interface can be used for searching (truncated or full), browsing while displaying metadata and table of contents. Various rules can be defined for different document types (e.g. : article-based in the case of periodicals or page-based in the case of books), texts, images, or PDF can be offered for downloading (the list of types is also extensible). This is the long description of news.